One night a few weeks ago I was walking the dog, and I had a flashback to a time 20 years ago when I had young kids and a golden retriever ... and would walk the dog at night just the way I was doing it now. I suddenly realized that despite all the changes in the world, most of the things we do every day aren't much different from what we were doing 20 and 30 years ago. From eating a bowl of cereal in the morning to ... well, as I pointed out, the toilet paper we use every day. For the most part, I still believe that, especially for the big things in life. But the other day I was rummaging through a used book store and picked up a copy of R Is for Ricochet by Sue Grafton. It's one of her alphabet mysteries. The series began in 1982 with A Is for Alibi, and continues to this day with her latest, published last year, U Is for Undertow. R Is for Ricochet came out in 2004. But the setting is California in 1987. The hero, the skeptical but soft-hearted Kinsey Millhone, is a private investigator who works out of Santa Teresa, Calif. (a fictional version of Santa Barbara), and in this episode she's been hired to save a self-destructive young woman who's involved in drugs, gambling and a man who's laundering money for organized crime. But the point is, the book takes place in 1987. And, boy, what a different world that was from today! For example, one of the characters had been working for Braniff Airlines, and did business at Crocker National Bank. Remember them? Names you haven't heard in a long, long time. Braniff went out of business in the 1980s, and Crocker was long ago gobbled up by Wells Fargo. Some evidence in the story involves canceled checks, discarded typewriter cartridges and an adding-machine tape. Okay, we still occasionally use checks (although they're beginning to seem anachronistic). But when was the last time you held a typewriter cartridge in your hand? When you were in college? An adding machine? We'd have to ask an octogenarian to get a first-hand memory of this ancient office artifact. Is it kind of like an abacus? Did it print out numbers in cuneiform? At one point, Kinsey is walking down the street, and she ducks into a phone booth. Even if you don't personally have a cellphone, when was the last time you saw a phone booth? Later, at home, to retrieve her phone messages Kinsey pushes a button and listens to the high-pitched squeal as the tape rewinds. I, myself, am not exactly an early adopter of technology; but I have to sift through a lot of memories before I get to one that involves a phone machine with a tape in it. Not to mention that the whole plot revolves around a brand new upscale mall. I guess somebody is still building malls somewhere, but the ones around me are all showing their age and suffer from several empty store fronts ... and the whole idea of a mall seems somewhat passe in this age of internet shopping. Finally, Kinsey and her friend go into a bar. There's a jukebox playing. With 45-rpm records! But the most disconcerting thing of all is ... people are smoking. These days smokers hang around outside in a designated area. It's been years since I've seen anyone smoking indoors. So that's why I say R Is for Revision. Since reading this book, I realize lot of things have changed since 1987. I have to submit a post about oil. Because it's been in the news. And I'm something of an expert. So even as a kid I knew that oil was a valuable commodity. It's better to have some than to need some. I also lived through the 1970s. I remember it was the fall of 1973 when I first heard of OPEC. This group of oil-rich countries proudly proclaimed an oil embargo in reaction to U.S. support of Israel during the Yom Kippur War. The price of a barrel of oil quadrupled from about $3 barrel to over $12 a barrel. A gallon of gas jumped from around 30 cents to ... (gasp!) a dollar. The oil embargo lasted six months or so; it made the stock market crumble, dragged the world economy into recession, and scared Americans into rethinking their dependence on foreign oil. Well, I'm joking about that last part. Because again in 1979 the Iranian Revolution resulted in a disruption of oil supplies, and the next year Iraq invaded Iran, causing further cuts in the flow of oil. The price of crude rose from about $16 a barrel to $40 a barrel, and a gallon of gas went back up over a dollar and higher. There were lines at the gas pumps. There was talk of gas rationing. Coupons were printed. President Carter said the oil crisis was the "moral equivalent of war." And Detroit responded by inventing the gas-guzzling SUV. Now we all know what happened in 2008, with a barrel of oil soaring over $100, and gas prices bubbling up to $4 a gallon. But the point is, if you're over the age of 50, you were probably prepared this time -- because you remember those oil-starved days of the 1970s and you're not surprised to see them come around again, and so now you won't be feeling the pinch of the current surging oil prices. You're probably driving a Prius or Honda or Ford Focus, not a Ford Expedition or Hummer. You're probably living in a place where you don't have to drive 40 miles to work, or log in 200 miles a week just to gather your groceries and do your errands. You have also probably insulated your house, and keep the thermostat low in the winter, and go easy on the a/c in the summer. You might even own one of those famous Jimmy Carter cardigan sweaters. And if you're really prescient, you've invested part of your IRA money in a low-cost energy mutual fund or ETF. Damn. I wish I had done all those things! Well, I've done some of them, and now I'm resolved to do the rest, because (as Jed Clampett might say) it's sure as shootin' that there will come another time when we have to pay $4, and then $5, for a gallon of regular unleaded gasoline. A lot of us is this corner of the blogosphere are retired, many supplementing our income with Social Security, or living mostly on Social Security. So why do we have to concern ourselves about jobs? Because people with jobs are the ones who pay for Social Security. There is no lock box. There's no reservoir of money that the government can tap into to cover Social Security payments. It's a system. Workers put money into the system; retired people take money out. The more people working, the more solvent the system. So when you look at this first graph, showing the number of Americans in the workforce, you should be concerned. 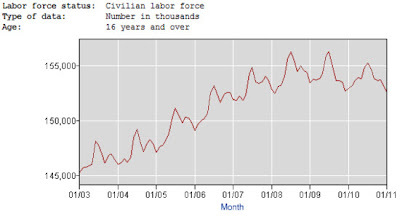 A couple of years ago there were about 156 million people in the workforce. Now there are 153 million. A loss of some 3 million people who are willing and able to work. The next graph shows people currently in the workforce who do not have a job -- and who are therefore not paying Social Security taxes. 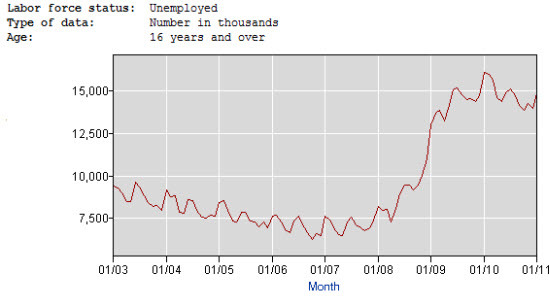 The number of unemployed has doubled since 2007, from about 7.5 million to 15 million. That's a lot of people not paying Social Security tax. Then consider the third graph. 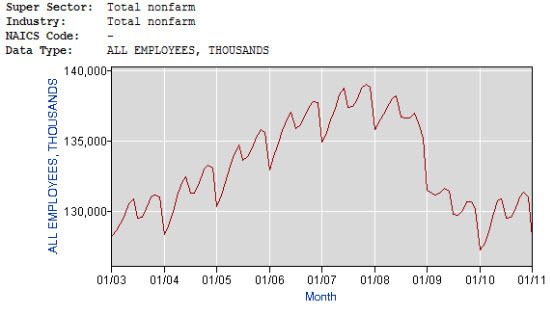 It's a measure of total nonfarm payrolls in the U.S. In 2007 there were almost 140 million workers -- people actually paying into the Social Security system. Now there are fewer than 130 million. 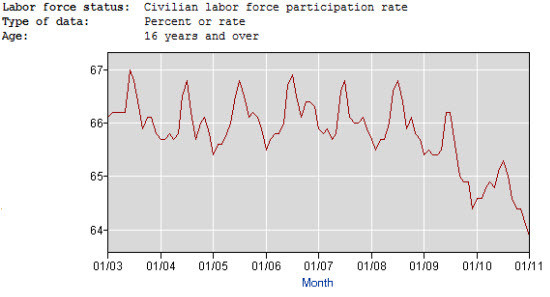 Finally, look at the percentage of people who participate in the labor force. It's down from almost 67 percent to below 64 percent. That's not a good trend. All these graphs tell the same story. 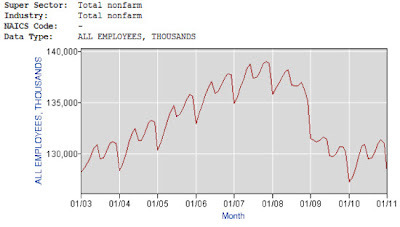 Fewer people working; not as many people even looking for work. In the past four years, 10 million fewer people are paying into Social Security (or Medicare). About 3 million have given up on even the prospect of working. Over 7 million others want to work -- and would be happy to pay their Social Security tax -- but can't find a job. So that's why retired people need jobs, too. Not to mention the fact that it's a really terrible situation for the people who need an income, but can't find a job. The moms and dads with kids. Early retirees. Young people. Do you have any kids? Do you know any 20-somethings? I really feel bad for them, because it's nearly impossible for them to land a job. And the jobs they do get are often not challenging, not particularly interesting, and offer little opportunity for advancement. Henry Snyder of Charleston, S.C., who has a master's degree in school counseling, was cited in an article by the AP (see below), attesting to this problem. Job availability in his area remains limited, he said, especially for young people. Many of his friends who are a few years out of college are still working the same low-paying jobs they took while students. I wish there were a magic wand to create jobs in this country. President Obama has offered some proposals for investing in the country's infastructure, lighting a fire under a clean energy program, reinvigorating our science and technology programs. Let's hope he gets somewhere with them. Finally, to end on a note of optimism, AP yesterday came out with an article called "Consumer Confidence at 3-Year High on Job Optimism." The optimism is measured, to be sure, but let's hope the optimism is justified. I have to admit, I'm confused. What I'm hearing is that we have to get the rich guys to pay their fair share. Personally, I think the rich guys should carry their fair share of the tax burden. After all, they're the ones with money and can afford to pay. Also, they didn't get rich by themselves; they got rich with help from family and friends, from their school system, their employees, their government -- sometimes literally with lucrative government contracts. It's time for them to give back a little. But that leaves me with two problems. First, who are the rich guys? They're the ones on Wall Street, certainly, who played fast and loose with the nation's finances then got bailed out by the government because they were "too big to fail." Most of them are not crooks; they are not Nazis. But they were irresponsible. And these people for the most part not only got away with their financial terrorism, but were rewarded for it, receiving bigger bonuses than ever. On the other hand, they're also paying back a lot of those government loans and if the stock market is any indication, they're helping to right the financial ship. Still ... it's hard to have much sympathy for them. What about government workers in Wisconsin and Ohio and elsewhere? According to one blog -- more than one blog -- they are dedicated but unappreciated firemen and teachers and family service workers. They devote their lives to their community and through collective bargaining have finally won a decent wage, but who now face draconian and punitive cuts to their salaries and benefits and lifestyles. But according to other blogs, these "public servants" enjoy benefits that employees in the private sector would envy. And they show no sympathy for poor suffering taxpayers who have larger and larger amounts sliced out of their paychecks to pay their salaries. I happen to live with a "public servant." I know she cares about her job and can often be found at home doing extra work that will benefit the taxpayers who pay her salary. And they don't pay her a very big salary, either. I also know several teachers. They work hard. They have a lot of demands on their time. But let's face it, they do enjoy a lot of vacation -- three or four times what a private employee gets -- and I know at least a couple who own weekend houses at the beach, so they must be paid pretty well, too. I saw one complaint from a fellow, now 68, who worked for his state government for 21 years. He never made much money. Now he's retired on $36K a year. This fellow doesn't seem rich to me. On the other hand, he retired at age 47 and has now been collecting retirement benefits for as long as he worked, and he's still going strong. I wouldn't call him rich; but I wouldn't say he's suffering that much, either. Would you? Here's my second problem. Even if we do get the rich people to pay higher taxes, it does absolutely nothing to address the real problem in this economy -- the unemployment and underemployment in our workforce. The fairest tax system in the world won't produce one job. And we need somewhere around 10 million new jobs -- hopefully reasonably dignified jobs with decent pay and some prospects for advancement -- to bring down the unemployment rate from its current 16 percent (counting those who've given up looking) to a more reasonable 5 percent, and offer some hope to our young people and secure the future of our country. Who's got some ideas for that one? Does Anything Cure a Cold? Last Friday I got home from my mid-winter break in Florida. By Monday, I'd come down with a cold. B subscribes to the germ theory of disease. She thinks I picked up a virus at a hotel or restaurant or somewhere else in a crowd of vacationers. I believe in the "chilly draft" theory of disease. I think I got the cold because of the sudden drop in temperature that assaulted me when I came back to New York. At least, that's what I told B. Then I thought a moment and wondered, "Is that an old wives' tale?" "Yes it is," replied B. "I don't care. I still think it's true." "My grandmother would agree with you," she deadpanned. Regardless, I am now coughing and sniffling and sneezing, and my head feels like it's as big as a beach ball. And so I'd appreciate any tips on how to make this cold go away. Does anyone have their own secret cold remedy they'd like to share? Anyway, I've got to hold onto something, so I've been downing 500 mgs. of vitamin C about twice a day, just in case. And I've been drinking my orange juice, something in normal times I usually forget to do. I keep trying to remember to force fluids. Orange juice. Water. Coffee and tea. I'm tempted to try beer; but at this point I doubt it would help. I've also been sucking on zinc gluconate homeopathic throat lozenges. I read something about these a couple of years ago. Three or four a day. They make my tongue sore, so they must be working ... right? Then, of course, I've been taking aspirin for aches and pains. I tried a DayQuil. It seemed to help a little. Last night I took a teaspoon of Nyquil. Dunno if it helps cure the common cold, but it sure made me sleep. Woke up kind of groggy though. I have not tried any Coricidin. I remember when I was growing up, my mother would feed us kids those little red pills when we got a cold. And ginger ale. You don't hear much about Coricidin anymore. I guess it's old news, so people have gone on to other things. And I can't stomach ginger ale anymore. Speaking of old ... one remedy I have not tried is chicken soup. Think that really works? Well, chicken pot pie is on the menu for dinner tonight. So maybe that'll help. Anyone watch the Grammy Awards show last night? For those of you who think the music ended with James Taylor or Pink Floyd (as I sometimes do), I'm happy to report that the world of popular music has been handed down to a new, exciting and very young group of performers. And I'm not talking about Lady Gaga, who gets a lot of press but leaves me kind of cold. The show did open with a nod to a few oldtimers. First came a rousing tribute to Aretha Franklin, featuring some great vocals by Christina Aguilera, Jennifer Hudson, Yolanda Adams, Martina McBride and Florence Welch. Bob Dylan, at age 69, sashayed out to sing "Maggie's Farm." He was completely upstaged by the two young bands backing him up: Mumford Sons, and The Avett Brothers. Mick Jagger, 67, and Barbra Streisand, 68, croaked their way through a couple of songs. I hate to say it, but they also looked old and out of place. One of my favorite performers, Gwyneth Paltrow (who at age 39 still seems young to me), did a hilarious number with a fellow named Cee Lo Green. I never heard of him either; but I do know the Muppets. (Fast forward through the first minute of the clip unless you want to hear the overlong intro. by Jamie Foxx). And one more -- a performance by Rihanna, Eminem, Dr. Dre and Skyler Gray. (Skip the first minute unless you like Seth Rogen.) To put your mind at rest, I checked out the lyrics for this song, "Need a Doctor." They do not in any way involve violence against women or anyone else. See what I mean? Our economy may be falling apart; our politics more strident than ever. But these days the world of music is in very capable and creative hands! I just got back from a two week vacation in Florida. I've been making an annual visit to the Sunshine state ever since I was walked down the gangplank to early retirement a few years ago. What I noticed during this year's trip was the throng of retired people making the winter migration. Well, duh . . . yet in previous years there were plenty of retired folks, of course, but also lots of families with little children, and some college-age kids, and also couples in their 50s vacationing by themselves. This year, the ratio of retired people to the general population just seemed much higher than usual. Everyone I met had white hair and walked with a crooked gait, and were heading off to retirement meccas like Sarasota or The Villages or Vero Beach. I realize this is a self-selected group of people -- retirees who are healthy enough and affluent enough take extended vacations in Florida. Nevertheless, I was struck by how many cheerful retirees, seemingly unaffected by economic doldrums, were enjoying this winter respite -- and how few younger people were making the trip. It made me consider how fortunate these retirees are, and I confess, it also brought to the surface a little twinge of envy. And it made me wonder if this group of people -- people from their late 60s to early 80s -- are perhaps the ones who hit the sweet spot of American history. Are they the luckiest generation? I'm talking about people born from the late 1920s to the early 1940s. For the most part, they were too young to face the horrors of World War II or Korea, and too old to be drafted into the army that slogged through the mud of Vietnam. This generation enjoyed the fruits of the post-war economic boom. They came into the workforce in the 1950s, when there was no such thing as foreign competition, and developed their careers during the 1960s when the economy was a powerful, productive engine. If they didn't go to college, there were union jobs aplenty in places like Detroit or California. Yet, they did go to college in greater numbers than ever before, paying a pittance in tuition compared to today's students. And unlike recent college graduates, who are lucky to have a job at all, they could write their own ticket at a major corporation, with a good salary, plenty of job security and a nice pension. People from this generation also benefited from medical advances, from Lipitor to Viagra, as well as many of the social changes of the late 20th century. Divorce had less social stigma. Abortions were available to those who needed them. Minorities began to shed their shackles. Ask Colin Powell (born in 1937) or entrepreneur Earl Graves (1935) or music pioneer Berry Gordy (1929). Ask Nancy Pelosi (born in 1940) or Martha Stewart (1941) or Supreme Court Justice Ruth Bader Ginsburg (1933). In 2011, this generation continues to benefit from the timing of their birth. Today's retirees enjoy a support system that their parents would envy -- and their children may recall with wide-eyed astonishment. These days a Social Security check averages $1075 a month. The parents of this generation, in 1980, took home Social Security averaging a measly $285 per month. Even after adjusting for inflation, the benefit today is about double what it was in 1980. Yet if you asked current 35-year-olds how much they expect to get in Social Security, do you seriously think they'd say -- Oh, about double what my parents are getting. Fat chance. They will have to work longer -- at least until age 67 -- and they think they'll be lucky to get any Social Security at all! A recent piece in The Wall Street Journal, "Generation Y Me?" outlines the plight of those born in the 1980s and '90s, blaming some of their economic woes on Baby Boomers. As a Baby Boomer myself, I will admit there's probably some truth to the complaint. Maybe Baby Boomers have it better than Generation X, who in turn have it better than Generation Y.
Americans have historically enjoyed a better life than their parents. And their children a better life still. Is it possible that, for the first time, the younger generation has a lower standard of living, a tougher time getting ahead in life? I don't know. None of us chooses which generation we belong to. We suffer the consequences. Or, if we're lucky, we enjoy the benefits. I've been vacationing in Florida for about a week. What surprises me is this: I've been looking and looking, but haven't found many baby boomers. One fact is evident: The oldest baby boomers are turning 65 this year. And according to stacks of studies and piles of reports, the first waves of boomers are beginning to retire. Some have pensions, medical insurance and bulging IRAs and can afford to opt for early retirement. 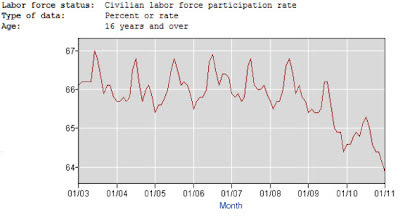 Others have left the workforce involuntarily. Some have fled the corporate world in terror. I suspect the media reports (like almost all media reports) are overblown. Maybe the first flurry of boomers have retired. But only the very oldest and richest. And perhaps even those ahead-of-the-curve boomers are not migrating to Florida. Early retirees in their late 50s and early 60s may have spouses who are still working, or children still in school, and they are not ready to pick up stakes and move to a distant location. Or perhaps Florida has gotten too crowded and polluted, and lost some of its sunny charm. Shall we blame it on Carl Hiaasen, who writes black comedy mysteries involving Florida lowlifes? In any case, while I have seen plenty of Snow Birds here in Florida, their hair is too white, and they have too many wrinkles, to count as baby boomers. I met an 82-year-old widower from Pennsylvania, headed to Sarasota to play golf with his buddies. A 70-something couple from Toronto looking to buy a winter retreat. A fellow from Illinois who proudly told me he went to work for John Deere in February 1963, and got a nice early retirement package in 1992. Meanwhile, the few baby boomers I have encountered are hardly retired. A 50-something woman who moved from Boston to Florida about five years ago and became a real-estate agent. A woman from Denver who told me she'd originally followed her boyfriend to Tampa, then settled in Key West where she's been designing and selling jewelry for 15 years. The native-born baby boomer who grew up around Naples and still lives there, running a marina. I've been to Florida many times before, with my kids when they were younger, and to see my parents after they retired to Florida's east coast. I always saw plenty of retired people, but also lots of loudly-dressed tourists and families with loud children, and teens with loud radios blasting across the beach. What seems different this year is the paucity of baby boomers and the plethora of old people. I don't know. Maybe we baby boomers are not going to retire to Florida like our parents did. I wonder if boomers will favor other Sunbelt oases. Or, are boomers going to stay home after they retire? Or flock to different retirement meccas? Or perhaps never retire at all? After all, those early retirement packages aren't so generous anymore. I used to joke that I would never retire to Florida. I wouldn't have to. With global warming, Florida weather was coming to me. Well, after this year I may have to change my forecast on that score. But I'm beginning to think there might be other winds that will blow baby boomers to different shores.